In a large bowl, mix together the oats, nuts, sunflower seeds and, if using, the flax or wheat germ. In a separate medium bowl, mix the oil, honey and vanilla. Add the wet ingredients to the dry ingredients and mix until well combined and lightly moistened. Bake for 25 to 30 minutes - stirring thoroughly halfway through the cooking time. Remove from oven when golden brown. 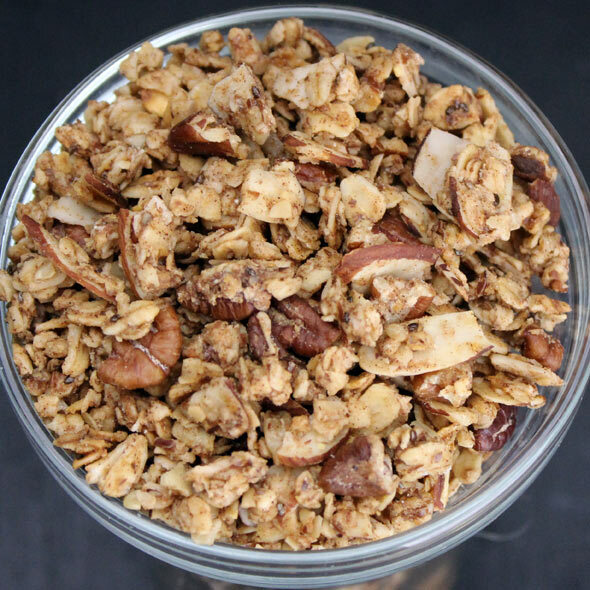 This recipe makes about 5 cups of granola which stores very well for an entire month if kept in an airtight container. For crisper results, spread the mixture over 2 cookie sheets for baking. That makes it so there's no dense areas within the granola that might retain moisture. I made this recipe once exactly as directed and it was very good. The second time I made it, I added 1/2 cup all-purpose flour (to help form clusters), 1 Tablespoon of chia seeds and I used 1/2 honey and 1/2 maple syrup for my sweetener. That version was even better. 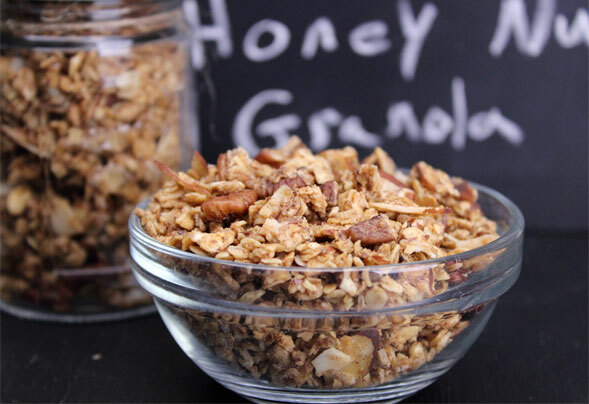 This trick can work for almost any granola recipe. Once the granola has baked and cooled, place 1/4 of it in a large bowl. Melt a couple ounces of chocolate in the microwave and mix that into the bowl of granola. Stir and then allow to cool. Mix the chocolate-coated granola with the rest of the granola. This is a fun recipe to play with. Try adding a handful of raisins or coconut. Chocolate chips are awesome too... but you should not add them until the granola is out of the oven and almost completely cool. Mr Breakfast would like to thank radner for this recipe. Recipe number 2319. Submitted 5/26/2008.